Engineers who have passed the Fundamentals of Engineering (FE) registration examination (formerly called the Engineer-in-Training….EIT exam) or both the FE and the Principles and Practices of Engineering (PE) registration examination in another discipline (such as civil, structural, mechanical or electrical engineering) and who have experience in the design of buildings and related infrastructure should consider becoming registered as an Architectural Engineer (AE). For those engineers who have passed the FE exam but not yet the PE, and have experience in the building design field, the AE registration can be your first PE registration of choice, or can be in addition to a PE registration (civil, structural, mechanical, electrical, etc.) that you pursue subsequently. The Architectural Engineer registration can also be an important complement to a PE registration you already hold (such as Civil Engineer, Structural Engineer, Mechanical Engineer, Electrical Engineer, etc.). The AE registration can open career paths for you and increase your value to your company or agency. Learn about the development of the Architectural Engineer registration from an academic, professional and registration perspective. Learn about the academic programs available to students interested in a career in architectural engineering. Learn about how the Architectural Engineer registration examination was developed and how this affects you. Anyone involved in the design and construction of buildings and associated infrastructure who is looking for looking for a way to advance her/his career path will want to consider this course. It is important not only open to graduates of architectural engineering programs, but also engineers experienced in civil, structural, mechanical, electrical and related engineering disciplines. This is an important course for all professionals committed to the building design and construction process. For recent graduates of Architectural Engineering programs…. You will learn how to channel your career so that that is rewarding and important to you. You will learn about how to pursue your registration as an Architectural Engineer and embark on your career designing buildings and related infrastructure. For Engineers experienced in design and construction of buildings and related infrastructure…. For experienced engineers registered in the civil, structural, mechanical, electrical and related disciplines, the Architectural Engineer registration offers you a way to add value to your career. This course will tell you how to expand your career horizons with the Architect Engineer registration. This course will introduce you to the Architectural Engineer professional registration now available in over 40 states. 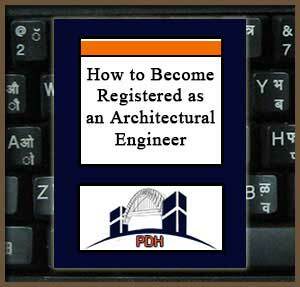 You will learn how you can take and pass the Architectural Engineer registration examination even if your academic training is in another technical discipline such as civil, structural, mechanical or electrical engineering and even if you already hold professional registration in another discipline. You will learn how this can greatly increase your value to your employer and clients. This course will introduce you to an additional career option available to you by becoming registered as an Architectural Engineer. You will learn about ABET-approved academic programs in architectural engineering and advances in the profession that have resulted in the Architectural Engineer registration examination developed by the NCEES now being offered in over 40 states. This professional registration option is available not only to graduates of architectural engineering academic programs but to graduates of other academic programs such as civil, structural, mechanical and electrical engineering. It can be either your primary professional registration option or in addition to a registration you already have obtained in another discipline. For engineers interested in a career in the design and construction of buildings, the Architectural Engineer registration will increase your career options and enhance your value to your company, agency and clients.